If you haven't heard of The Maine, you will. The American rock band hailing from the least likely locale of Tempe, Arizona, recently released its third studio album. And while not everyone is going to like the clear departure from pop-punk, there are indie moments in between the straight up rock tracks. The new sound is indicative of how the band had been previously shaped by its former labels. Fearless Records pushed them toward frisky pop punkers with Can't Stop Can't Wait. Warner Brothers pushed them toward pop, without a stitch of punk left in their approach, on Black & White. Both albums were fine, but never gave the band much bite to break out or even climb up. Pioneer gives The Maine its first indie album. 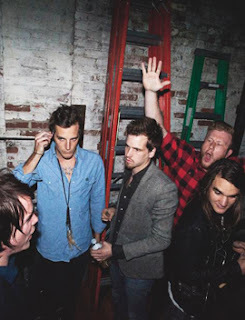 This time around, The Maine is on their own. The new album, Pioneer, is running under their own label, Action Theory Records. While some of the songs keep the soft rock melodies that made up their last album, the new tracks that don't give listeners more insight into the band behind the brand. That doesn't mean everything works. Much of it is slowed down with a surprising amount of polish for a band that decided to cut, run, and do its own thing. Where Pioneer works is right out of the box with Identify, which adds in some remnants of the past with an alternative rock vibe. The theme is about busting away from what circumstances might have made you, a fakery, into your own person. My Heroine is remarkably mainstream into the open, but the band breaks it up toward the middle, obviously wanting to work in more guitar work. It works until it wastes space with a full chorus of upbeat dada dadada da das. If you can forgive the flub, which is hard, the song still shows potential. Misery, an alt rock ballad, is one of the best of the bunch, lyrically, with John O'Callaghan delivering more roughness around the edges than on previous outings. It's a good sound for him, especially on a redemptive lost-found-forgiven song like that one. Here's a sample. Like We Did (Windows Down) seems to hit home for where the band is, almost stuck in a pre-midlife crisis and already missing everything they lost on labels, touring, and without responsibility. It's painfully obvious these guys want to feel in control of their lives instead of answering 20 questions with Walgreens logos spaced behind them. Pioneer is likely named after the album's largely liberated theme. It measures up smartly with the whirlwind they've experienced in the last five years. Shortly after bassist Garret Nickelson and drummer Pat Kirch met six years ago, John O'Callaghan — without any singing experience whatsoever — joined up as an unlikely frontman. Within one year after originally starting with guitarists Ryan Osterman and Alex Ross (who never produced an album), Kennedy Brock and Jared Monaco had stepped in for the singing with Fearless. Since then, they've been pushed forward well away from the EP that predated Can't Stop Can't Wait. And it's no wonder they've felt trapped on a label treadmill. Perhaps there is an irony in the album. While there isn't much angst in the delivery that would have better carried with their pop-punk following, the angst is written all over the lyrics. Every single track follows the theme of moving the control of others. All in all, the band does a fine job handling their promotions, with the help of a management company. One area where they could have done better is in releasing with one fully produced video already out there. Instead, they're playing a net-zero win releasing "buy me" teasers. Nowadays, it's give to get. The Maine Makes Pioneer Tread Lightly At 3.8 On The Liquid Hip Richter Scale. I can see where some people would be disappointed with the album as a whole. But there are many tracks that make up for it, especially after what could be called a catastrophic year for rock with dozens of bands turning their guitar amps down to chase pop crowds. At least these guys aren't doing that. The tracks to look for include Identify, Misery, When I'm At Home, and Like We Did (Windows Down). Skip the rest, pretending Time, Jenny, and Waiting For Sunshine aren't on it. Pioneer by The Maine is on iTunes. You can order the CD from Barnes & Noble. And the self-released album can be downloaded from Amazon.